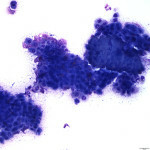 A corneal scrape from a 9 year old mare was submitted to the clinical pathology laboratory for cytologic evaluation. The history provided with the submission detailed a 1.5 week history of a non-healing corneal ulcer. The lesion had been treated by another veterinarian with Neomycin, Polymyxin B, Bacitracin ophthalmic ointment with no improvement. The lesion was approximately 4mm in width, and located under the third eyelid at the corneal limbus. 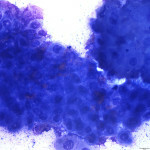 Grossly, the lesion was described as pink in color with raised, granulomatous tissue with visible white granules. The submitting veterinarian assessed the eye as being non-painful. 1. 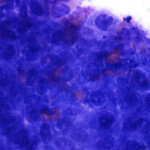 What cell types are present? 2. 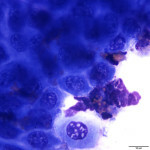 How would you describe the major cell population? 3. What are you differentials for the underlying etiology?